HowToRepairGuide.com: Blower motor not working on GMC yukon? The first issue is MOST likely the Front Blower Motor resistor going bad. It is located right next to the blower motor, under passenger side below glove box, it'll have 7 wires (i think) going into it and 2 wires out to blower motor. There has been a service bulletin issued for that concern. Here is a copy of it, notice, it says to repair the connector at the resistor. This bulletin is being revised to clarify the Warranty Information. Please discard Corporate Bulletin Number 05-01-38-012B (Section 01 - HVAC). Some customers may comment that the blower will only work on low speeds or has become inoperative. REPLACE THE BLOWER MOTOR RESISTOR AND RESISTOR MODULE CONNECTOR. Lower the hush panel or close-out panel enough to gain access to the resistor module connector. Disconnect the connector from the resistor module. Remove the tape from the wiring harness to expose the wiring. Cut the wires back far enough from the connector to eliminate any melted insulation on the wire. Use the old connector as a map for splicing the wires for the new connector. Be sure to use the correct crimping tool from the terminal repair kit J 38125. Use only Duraseal splice sleeves. Other splice sleeves may not protect the splice from moisture or provide a good electrical connection. Install the new connector. Use the yellow splice sleeves provided with the connector. Install new blower motor resistor. Reinstall the fuse or connector block. Test the blower motor to make sure all speeds are functional. Reinstall the hush panel/close-out panel. For vehicles repaired under warranty, use the table. On some 2003-2007 model year Chevrolet Avalanche, Suburban, Tahoe; GMC Yukon, Yukon XL; and 2003-2007 model year Chevrolet Silverado and GMC Sierra vehicles equipped with a manual heating, ventilation, and air conditioning (HVAC) system (CJ3) or heavy duty heater (C42), the interface between the electrical terminals of the relay resistor module and the wiring connector that powers the module may be incapable of conducting higher current levels for sustained periods of blower motor operation. In addition, moisture and other contaminants may enter the fresh air intake plenum and contact the internal circuit of the module or corrode the terminals. If any of these were to occur, the relay resistor module or wiring connector could overheat and the HVAC blower may not function on certain blower settings or may be inoperative. This may be accompanied by a burning smell or smoke. This special coverage covers the condition described above for a period of 10 years or 150,000 miles (240,000 km), whichever occurs first, from the date the vehicle was originally placed in service, regardless of ownership. Dealers are to install a new blower motor resistor and resistor module connector. The repairs will be made at no charge to the customer. For vehicles covered by Vehicle Service Contracts, all eligible claims with repair orders on or after May 10, 2011, are covered by this special coverage and must be submitted using the labor operation codes provided with this bulletin. Claims with repair orders prior to May 10, 2011, must be submitted to the Service Contract provider. Involved are certain 2003-2007 model year Chevrolet Avalanche, Suburban, Tahoe; GMC Yukon, Yukon XL; and 2003-2007 model year Chevrolet Silverado and GMC Sierra vehicles equipped with a manual HVAC (CJ3) or heavy duty heater (C42). Important: Dealers are to confirm vehicle eligibility prior to beginning repairs by using the Applicable Warranties section in the Global Warranty Management system. Parts required to complete this special coverage are to be obtained from General Motors Customer Care and Aftersales (GMCC&A). Note: The resistor module connector and blower motor resistor will need to be replaced if one or more of the symptoms below is present. Determine if one or more of the above symptoms is present. If required, refer to HVAC diagnostic information in SI. Refer to Resistor Module Connector and Blower Motor Resistor Replacement in this bulletin if one or more of the symptoms are present. Other HVAC repairs are NOT covered in this product safety special coverage bulletin. •Remove the blower fuses (Htr A/C & HVAC 1 fuses). •Lower the close-out panel enough to gain access to the resistor module connector. •Disconnect the connector from the resistor module. Note: Connector replacement is required even if the connector was replaced on a previous service repair. •Remove the tape from the wiring harness to expose the wiring. 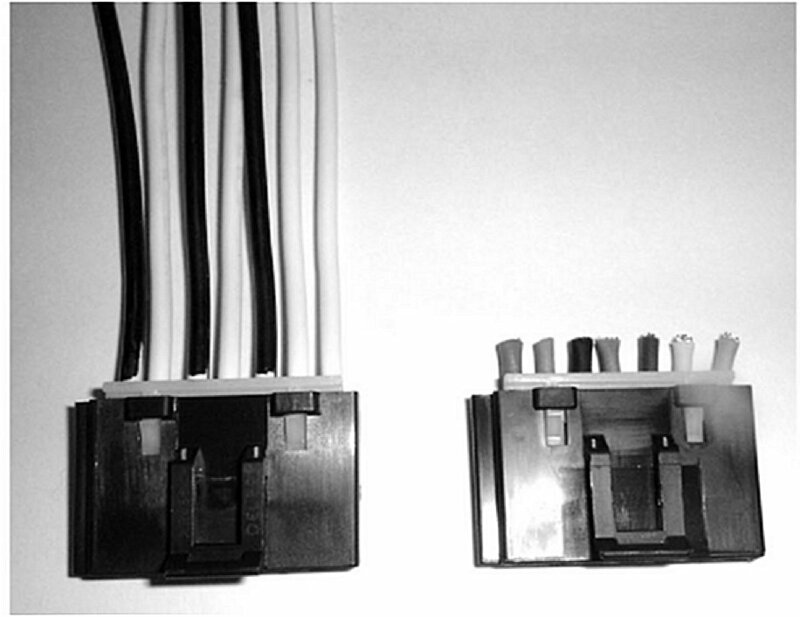 •Cut the wires back far enough from the connector to eliminate any melted insulation on the wire. Note: Use the old connector as a map for splicing the wires for the new connector. Be sure to use the correct crimping tool from the terminal repair kit J 38125. Use only Duraseal splice sleeves. Other splice sleeves may not protect the splice from moisture or provide a good electrical connection. •Install the new connector. Use the yellow splice sleeves provided with the connector. •Install the new blower motor resistor. •Reinstall the fuses. Test the blower motor to make sure all speeds are functional. •Reinstall the hush panel/close-out panel. Customer requests for reimbursement of previously paid repairs for the condition described in this bulletin are to be submitted to the dealer May 31, 2012, unless otherwise specified by State law. Repairs must have occurred within 10 years of the date the vehicle was originally placed in service, or 150,000 miles (240,000 km), whichever occurs first. All reasonable customer paid receipts should be considered for reimbursement. The amount to be reimbursed will be limited to the amount the repair would have cost if completed by an authorized General Motors dealer. • A completed Customer Reimbursement Request Form. This form is mailed to the customer or can be obtained from the dealer. • The name and address of the person who paid for the repair. • VIN, original paid receipt confirming the amount of repair expense(s) that were not reimbursed, a description of the repair, and the person or entity performing the repair. If a reimbursement request is denied, dealers MUST provide the customer with an explanation, in writing, as to why the request was denied. GM expects all reimbursement requests to be properly resolved within 30 days of receipt. If the denial was due to missing documents, the customer can resubmit when the missing documents are obtained, as long as it is still within the allowed reimbursement period. The General Motors Courtesy Transportation program is intended to minimize customer inconvenience when a vehicle requires a repair that is covered by the New Vehicle Limited Warranties. The availability of courtesy transportation to customers whose vehicles are within the warranty coverage period and involved in a product program is very important in maintaining customer satisfaction. Dealers are to ensure that these customers understand that shuttle service or some other form of courtesy transportation is available and will be provided at no charge. Dealers should refer to the General Motors Service Policies and Procedures Manual for Courtesy Transportation guidelines. Submit a transaction using the table below. * The amount identified in "Net Item" should represent the dollar amount reimbursed to the customer. General Motors will notify customers of this special coverage on their vehicles (see copy of typical customer letter included with this bulletin - actual divisional letter may vary slightly). As the owner of a 2003-2006 model year Chevrolet Avalanche, Suburban, Tahoe; GMC Yukon, Yukon XL; or 2003-2007 model year Chevrolet Silverado and GMC Sierra vehicle, your satisfaction with our product is very important to us. This letter is intended to make you aware of a condition that may affect your vehicle. The relay resistor module (which controls blower motor speed) and/or the wiring connector that powers the module may overheat during sustained blower motor operation, or if moisture and other contaminants contact the internal circuit of the module. These occurrences may result in an inoperative blower motor, or result in a blower motor that functions only on certain settings. This may be accompanied by a burning smell or smoke. Do not take your vehicle to your GM dealer as a result of this letter unless you believe that your vehicle has the condition as described above. What We Have Done: General Motors is providing owners with additional protection for this condition. If this condition occurs on your 2003-2007 model year Chevrolet Avalanche, Suburban, Tahoe; GMC Yukon, Yukon XL; or 2003-2007 model year Chevrolet Silverado and GMC Sierra vehicle, equipped with a manual HVAC or heavy duty heater, within 10 years of the date your vehicle was originally placed in service or 150,000 miles (240,000 km), whichever occurs first, the condition will be repaired for you at no charge . Diagnosis or repair for conditions other than the condition described above is not covered under this special coverage program. What You Should Do: If you believe that your vehicle has the condition described above, repairs and adjustments qualifying under this special coverage must be performed by a General Motors dealer. You may want to contact your GM dealer to find out how long they will need to have your vehicle so that you may schedule the appointment at a time that is convenient for you. This will also allow your dealer to order parts if they are not already in stock. Keep this letter with your other important glove box literature for future reference. Reimbursement: If you have paid for repairs for the condition described in this letter, please complete the enclosed form and present it to your dealer with all required documents by May 31, 2012, unless otherwise specified by State law. If you have any questions or concerns that your dealer is unable to resolve, please contact the appropriate Customer Assistance Center at the number listed below. We are sorry for any inconvenience you may experience; however we have taken this action in the interest of your continued satisfaction with our products. GM bulletins are intended for use by professional technicians, NOT a "do-it-yourselfer". They are written to inform these technicians of conditions that may occur on some vehicles, or to provide information that could assist in the proper service of a vehicle. Properly trained technicians have the equipment, tools, safety instructions, and know-how to do a job properly and safely. Labels: Blower motor not working on GMC yukon? Hello, I currently own a 2003 GMC Yukon Denali. I have been researching this issue. My blower is not working. I have called GMC as well as local dealers and of course my vin number is not covered under this "special coverage". According to the above is does not have to do with VIN. Not very happy! Can anyone shed some light on this at all.